What to do with 2 days in Paris? We're arriving in Paris Friday for a very short visit before our bike trip in Normandy starts. Should we do the boat on the Seine at night?? Any other “must do’s” you can think of or restaurant we should go to? Only have 3 nights and 2 days really! So exciting!! It's apparently really hot in Paris right now, so a boat ride on the Bateaux Mouches might be nice, if you can be on the upper deck and it's open. Two days? All I can recommend is walking walking walking around everywhere. Go from Place Vendome (that's where you're staying, right?) to the Opera to the Madeleine to the place de la Concorde, then (if you can bear it) up the Champs Elysees to the Arc de Triomphe. Then -- perhaps the next day, go to the Trocadero for an unforgettable view of the Eiffel Tower, then go down to the Seine and go "left" along the quais, admiring the houseboats etc., then cross the Pont Alexandre III. Okay, actually stop here and go to the restaurant at le Grand Palais called Le Minipalais. Then cross over the Seine, head toward the Invalides, wander through there and then go to the Musee Rodin. Great shady garden to cool off in. If you only have a few days, do NOT try to actually go into places like the Eiffel Tower or the Louvre. You'll spend too much time in line. If the weather were cold, I'd recommend Angelina on rue de Rivoli for a hot chocolate! 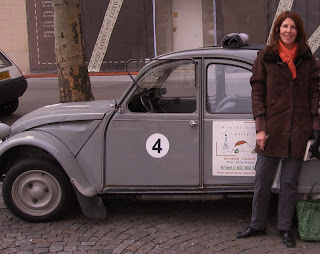 If you want something fun, try a car ride in a classic Deux Chevaux through Paris through Quatres Roues sous un parapluie. The Palais Royal is another of my favorite spots. And Cafe Marly next to the Louvre is a great spot to stop for lunch or dinner. Of course, the classic Cafe de Flore or Les Deux Magots in the 6e are great even just to stop by for a coffee or glass of wine. Great people watching, which is what Paris is all about. Have fun and send photos!!! ps. Avoid Montmartre Place du Tertre, avoid Chatelet les Halles, and do not pay any attention to beggars or to anyone who asks "Do you speak English?" They are gypsies and/or pickpockets. pps: In all establishments, stores, restaurants, boutiques, buses, taxis, whatever, always begin with "Bonjour, Monsieur," or "Bonjour, Madame." Then move to English if necessary. But you'll always get better service. And "Merci, monsieur/madame, au revoir," at the end. It will make a world of difference in your visit!!! I'm sure there are favorites that I have forgotten. I neglected shopping spots and the Hotel de Ville. What have I left out? What do you think? What would YOU have suggested? How would you recommend condensing Paris into 2 days? 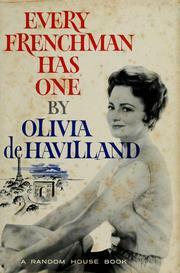 Fifty years ago, Olivia de Havilland, a classic in her own right, wrote a classic about being an American in France. I don't have sales statistics on her memoir Every Frenchman Has One, but I hope it was a best-seller. She wrote it about the challenges of adjusting to life in France, married to the dashing author Pierre Galante. It still resonates today. Miss de Havilland is still living in Paris and is as gorgeous and gracious as ever at age 94. A few years back, at the American Cathedral, I had the delight of talking with her about her book after a service. After some introductory conversation and enthusiasm, I begged her to re-issue her fabulous and funny book. It would be an instant "re-born" classic! "Oh, yes, I should do that," she replied in her lilting and charming voice. "I think they still have the plates somewhere." Oh, and what does every Frenchman have, according to Miss de Havilland? Ha. Not so fast, and get your minds out of the gutter. Every Frenchman has a liver.